Did You Know You Could Donate to Zion Lutheran Church Online? Earlier in 2015, we did a survey to determine whether there was any interest in Zion offering Online Giving. Based on the survey results we have decide to begin offering an electronic option for those members who would like to use this service. Since late last year, an electronic option for making regular and special offerings has been available. Contributions can now be transferred automatically from your checking or savings account. The secured service provider is Vanco Payment Service, which is used by most LCMS churches throughout the country. As you know weekly offerings can fluctuate significantly from week to week due to vacation, travel, illness and other circumstances, but when contributions are automated there tends to be less fluctuation in giving throughout the year. For those individuals who are interested in signing up for the Online Giving just follow the instructions below. or the photo at the bottom of the page. After this, Jesus, knowing that all was now finished, said (to fulfill the Scripture), “I thirst.” A jar full of sour wine stood there, so they put a sponge full of the sour wine on a hyssop branch and held it to his mouth. When Jesus had received the sour wine, he said, “It is finished,” and he bowed his head and gave up his spirit. Since it was the day of Preparation, and so that the bodies would not remain on the cross on the Sabbath (for that Sabbath was a high day), the Jews asked Pilate that their legs might be broken and that they might be taken away. So the soldiers came and broke the legs of the first, and of the other who had been crucified with him. But when they came to Jesus and saw that he was already dead, they did not break his legs. But one of the soldiers pierced his side with a spear, and at once there came out blood and water. Jim stands with his son at Gettysburg. They have toured the battlefields by car with a Licensed Battlefield Guide. They have visited the Civil War museums, looked at the blackand-white photographs, listened to Lincoln’s Gettysburg Address, and remembered those three days in July 1863. Now they are about to leave, and Jim tells his son, once again, the story. It’s what they have heard from others and what he has gleaned from history, but this time it’s personal. It is his story, as a father tells his son why this place has meaning for him, not only as a student of history, but as a citizen of this country and as a father raising a son to treasure the freedoms for which others have fought and died. There are places in this world that evoke stories — stories that one generation passes on to another. By telling these stories, we not only remember the past, but we encourage one another to live in the present with a deeper sense of the value of life and community. ❚ What are some places that are important to you and to your family? Why? ❚ What stories do you tell to communicate the significance of those places? Just as places in our lives have significance and stories, so, too, do places in Scripture. One such place throughout Israel’s history was the temple in Jerusalem. Read about the dedication of the temple by Solomon in 1 Kings 8:12–26. ❚ What is the story of God’s relationship to His people that Solomon tells when he dedicates the temple? ❚ Although God is beyond our understanding (v. 12), He promises to dwell in the temple for His covenant people. What other promise about God’s dwelling among His people does Solomon recall in his prayer (vv. 25–26; see 2 Sam. 7:4–13)? Isaiah continues this story by prophesying of a time when God will dwell among His people through a chosen servant in a mysterious way. Read Is. 52:13—53:5. ❚ What is strange about this servant of God? ❚ What does God promise to do for all people through this despised and rejected servant (Is. 53:5)? Peter healed a lame man who was begging outside the temple. After the man’s healing, Peter preached to the crowd. In this sermon, Peter told the story of God. It was the story of Jesus, the suffering servant, who was God (the “Author of life”) and had come in the midst of His people to save them from their sins. ❚ How is the story of Jesus connected to the history of Israel (vv. 22–26; see Gen. 12:1–3)? ❚ How did God’s people respond to Jesus (vv. 13–15)? ❚ How did God act in response to their rejection (vv. 15–16)? ❚ What was God now doing through Peter’s preaching of the story of Jesus (v. 26)? The history of Jesus that Peter preached was not just for others but for himself as well. Recall from memory or read about Peter’s relationship with Jesus (cf. ohn 13:36–38; John 20:19–23; and John 21:15–19). ❚ How was the death and resurrection of Jesus a personal story for Peter? Samuel Crossman (1624–83), an Anglican priest, composed this poem in the latter part of the 17th century. It was not originally intended to be a hymn. Instead, Crossman’s poem first appeared as one of a collection of nine that he attached to a conduct book he had written for young men. 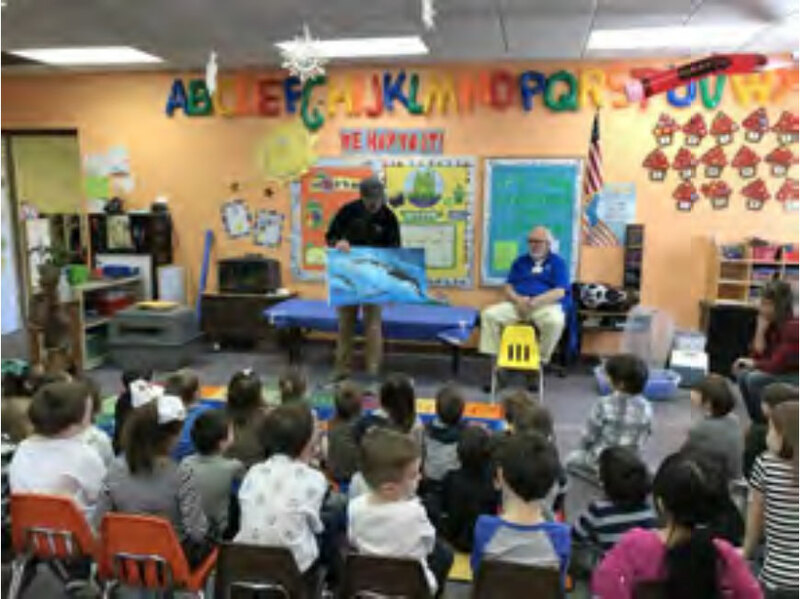 Here he told religious stories and offered encouragement for godly living that children might grow in the faith. ❚ As you read through the stanzas of the hymn, what is the story being told? Where does it start? What happens? And where does it end? ❚ What are creative ways we retell this same story today to our children? As a piece of devotional verse, Crossman’s poem has much in common with the religious lyrics of earlier 17th-century poets such as John Donne and, more importantly, George Herbert. The religious lyric sought not only to communicate a religious subject but also to foster personal meditation upon it. ❚ Where does Crossman invite you to meditate personally upon the story of Jesus that he is telling? ❚ What discoveries about yourself and about God’s work in Jesus happen in those moments of personal meditation? The first line of the hymn offers the major theme for devotional contemplation: God’s love for us in the Passion of Jesus Christ (“My Savior’s love to me”) is a love that lies beyond our understanding (“is love unknown”). Each stanza of the hymn takes a different moment in the Passion of Christ and ponders how that moment reveals a divine love beyond human understanding. Read stanza 1 and then read Rom. 5:6–11. ❚ Why is this love of God something beyond our understanding? ❚ How should God treat us on the basis of our actions? ❚ How does God treat us because of His love? ❚ How does the death and resurrection of Jesus relate to that strange act of divine love for the “loveless” (cf. Rom. 5:15–18)? Choose one stanza (or more if you have time) and meditate upon the story of Jesus’ Passion and its meaning for your life by answering the following questions. ❚ What moment in the life of Jesus does this stanza describe? ❚ How do we see our sin in that moment? ❚ How do we see God’s amazing grace? In the closing stanza of the hymn, the poet desires to stand outside the tomb of Jesus and to devote his days to telling the story of God’s love in the Passion of Christ (“Here might I stay and sing, / No story so divine!”). As God’s people gather in worship, we, too, join in that activity. ❚ What are ways in which we, as God’s people, retell the story of Jesus’ Passion every time we gather on Sunday morning? ❚ How do we do this particularly in the season of Lent? ❚ This story could obviously be retold as merely a fact of history. How do we proclaim that this is a personal story, a present-tense experience of God’s real love for each and every one of us in Christ? While we retell this story in worship, we also share it with others out in the world. Like the father with his son at Gettysburg, we share the meaning of this event in all aspects of our lives. ❚ How does God’s love for us, made known in the death and resurrection of Jesus, relate to how we live and how we speak in the world? ❚ Think about the past week, the people you have met, the places you have been, and the things that have happened. Identify one place in this past week where you can now look back and see God’s love for you and for others in Jesus Christ. Share that place and that story with one another. Whether out in the world or gathered in worship, God’s people have been given a story to sing. Today, we sing again that story of God’s love for sinners in Jesus Christ. ❚ Sing or read together LSB 430. Lord God, bless Your Word wherever it is proclaimed. Make it a word of power and peace to convert those not yet Your own and to confirm those who have come to saving faith. May Your Word pass from the ear to the heart, from the heart to the lip, and from the lip to the life that, as You have promised, Your Word may achieve the purpose for which You send it; through Jesus Christ, our Lord. Amen (For blessing on the Word, LSB, inside front cover). The Killinger family having fun at our photo booth at the Ice Cream Social. How cute! Miss Betty from the Pittsburgh Cultural Trust entertains our 2s with puppets. 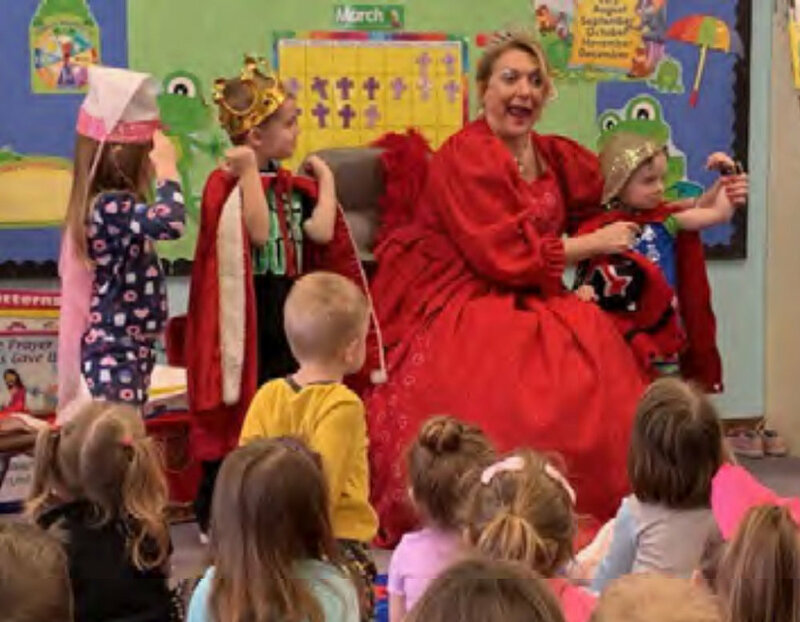 The “Queen of Hearts” acts out a story with the children. Oh my…..what big muscles the knight has! Lydia and her family enjoying one of Pastor’s famous ice cream sundaes. “Disco” seems mighty interested in our fish tank. Hmmmm….we think he’s looking for lunch! A behind the scenes look at the assembly line of our awesome sundaes. A huge thank you to Pastor and Anna for helping us make our event such a success. 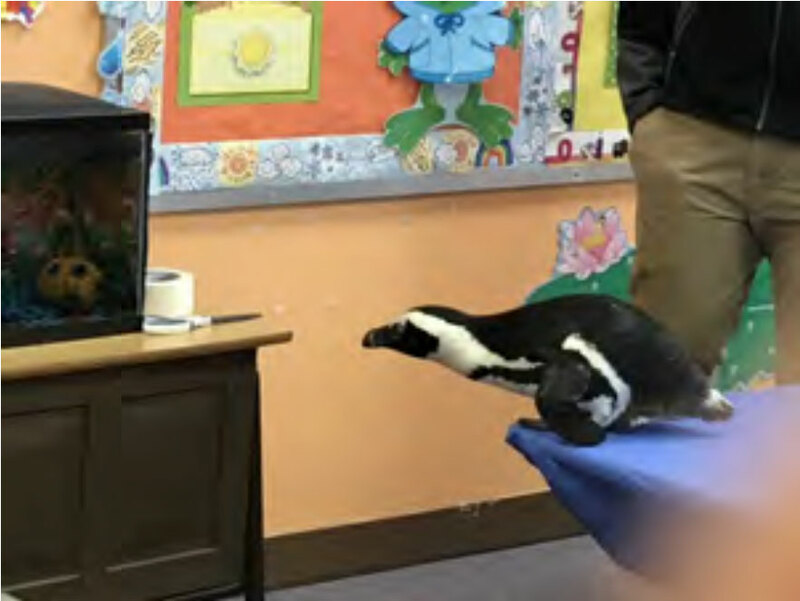 The National Aviary read a book about Penguins to the students prior to introducing “Disco”. Frankie and his dad enjoying their time together at Dads, Dudes and Donuts. Meet the staff of the Preschool. We all had such a fun night. Zion is truly blessed to have such a dedi-cated group of women. Ice cream anyone? 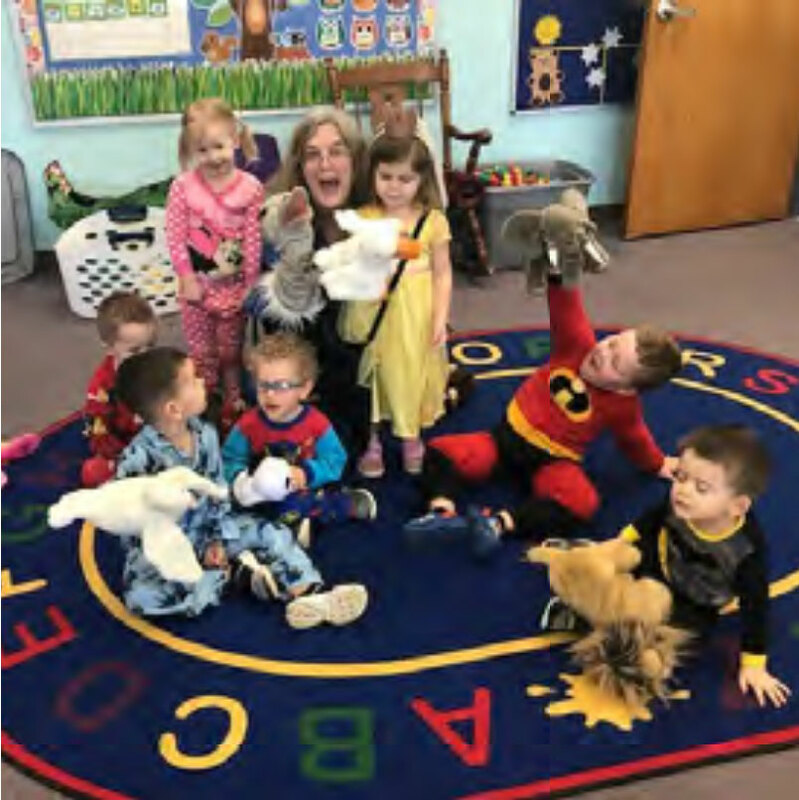 Our annual Preschool Spirit Week was, once again, a huge success! The week started out with Spirit Night at Chick-Fil-A, and then visits from the National Aviary, the Pittsburgh Cultural Trust and our favorite “Queen of Hearts”. 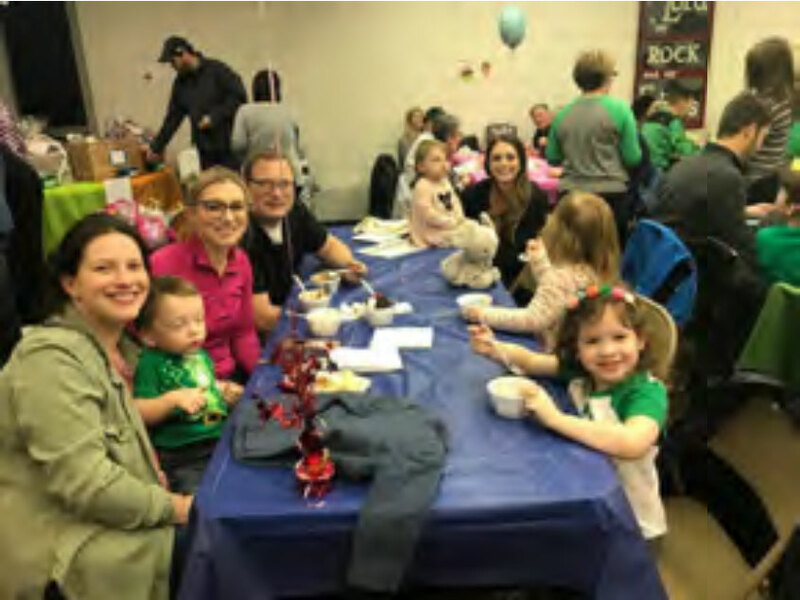 We also wel-comed all of our “Dads, Dudes and Donuts” for a fun breakfast, and concluded with our Ice Cream Social and Art Show Fundraiser. What a blast! Here’s a quick look at our exciting week. The Holy Gospel according to St. Luke, the twentieth chapter.